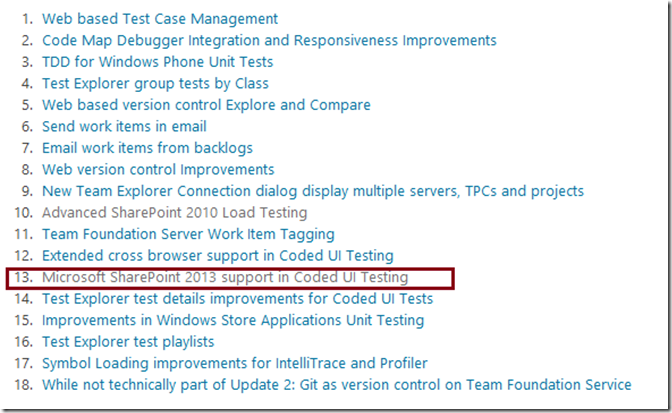 Visual Studio 2012 Update 2 Introduces SharePoint 2013 support for Coded UI Testing! Yesterday, Charles Sterling from the Visual Studio Product Team announced the availability of February CTP for Visual Studio Update 2. There is a bunch of great features that will be introduced in Update 2, you can get a glimpse of those features and download the CTP from here. The great news for me is that SharePoint 2013 is finally supported for Coded UI Testing as shown in the feature list below. To understand more about Coded UI Testing for SharePoint, you can watch this video. It’s in Arabic but you should understand what’s happening even if you are not an Arabic speaker.